Frighten your guests with these chilling Halloween wedding cakes and ideas for ghostly Halloween cupcakes. 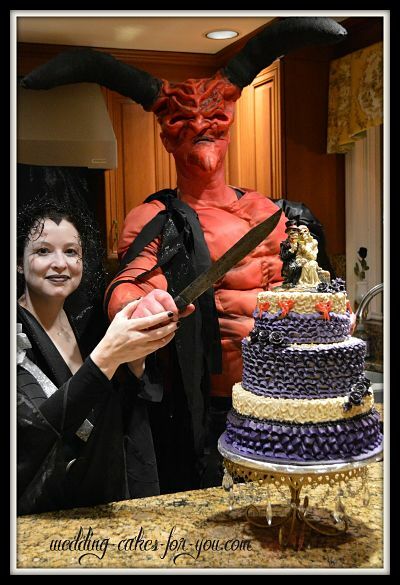 A surprise wedding cake added a nice touch to a Halloween party with three sets of brides and grooms. This chocolate buttermilk cake filled with caramel is covered in dark purple and cream buttercream ruffles, black roses and a "Love Never Dies" cake topper. Watch the video to see a fast motion of me making it and the bride and groom cutting it together. Watch me put together a wedding cake in fast motion. The techniques to watch for in the video are the purple buttercream ruffles, black buttercream roses piped onto tiny marshmallows with toothpicks, red bows and a white lace piping called cornelli lace. Kinda creepy but cute! 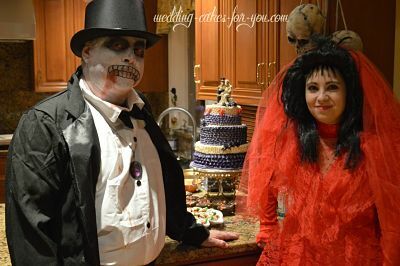 My good friends Beth and John always go all out with a fabulous party with award winning makeup and costuming. The cake was a surprise and they loved it. 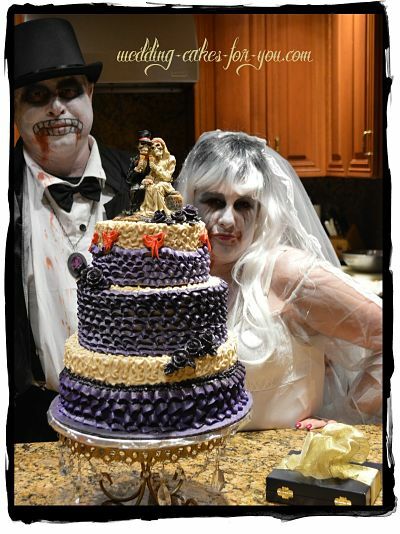 It also has the perfect toppers for a Halloween wedding cake. I don't sell the "Love Never Dies" toppers but you can search and find them online. Are you interested in learning how to make wedding cakes? or tiered cakes of any kind? Here is a link to my e-Books which people are really RAVING about. Their were three bride and groom couples at this party so it was the perfect photo op for them. I loved them all. Everyone really enjoyed my now famous chocolate buttermilk cake. I have my top recipes in an e-Book for you here. I share all of the best and with great detail. People are LOVING it. Search for the Skeleton Bride and groom. The buttercream recipe that I used for this cake was my simple one with confectioner's sugar. It's quick, easy, stable and people love it. You can control how much sugar you want to add and flavor it with just about any extract. My favorite flavors are vanilla and almond.